A delegation of international experts researching intercultural and interreligious dialogue and tolerance has visited the Shamakhi Juma Mosque in Azerbaijan. The delegation was informed that the mosque was one of the oldest Muslim temples on the territory of Azerbaijan, in the South Caucasus and the entire Middle East. It was built at the time of Caliph Khalid Ibn Valiyad in 743 in honor of the arrival of his brother, Muslim ibn Valiyad, in Azerbaijan. According to some sources, defeated by the army of the Caliphate, Khazar Khan adopted Islam at this very mosque. The devastating earthquake that hit the Shamakhi province, one of the largest provinces in the Caucasus, in 1859 wiped the city off the face of the earth. Following the quake, the administrative center of the province was relocated to Baku. The restoration of the mosque in the aftermath of the disaster was entrusted to Gasim Bay Hajibababayov, a native of Shamakhi. The earthquake that occurred in 1902 could not destroy the mosque as the shrine managed to withstand the disaster. Then a decision was made to restore the mosque on the existing basis. Initially, the restoration work was supervised by architect Zivarbay Ahmadbayov and then by Polish engineer and architect Joseph Ploshko. The restoration work carried out in accordance with Ploshko's original design was not completed. But even the unfinished mosque retained its grandeur. During the massacre unleashed by the armed groups of Armenian Dashnaks in March 1918, an act of genocide was committed in Shamakhi. The bloodiest massacre occurred at the Juma Mosque. Upon seeing that the people of Shamakhi had taken refuge in the mosque, the house of Allah, the Armenians set fire to it and killed 1,700 innocent people. In the Soviet times, the mosque was not used for the intended purpose for obvious reasons and faced the threat of destruction. But at the initiative and on the instruction of national leader Heydar Aliyev, who was very attentive to the development of all spheres of life in Azerbaijan, including the preservation of national and spiritual values, this historic building was renovated in 1980. 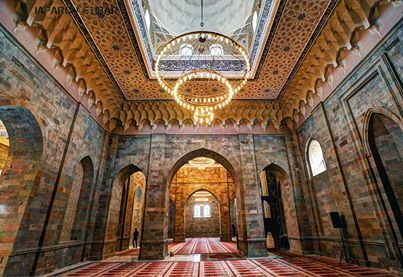 The visiting experts were told that the major overhaul and reconstruction of Shamakhi Juma Mosque, carried out as part of the "Tolerance Location: Azerbaijan" project of the Heydar Aliyev Foundation, have always been in the focus of attention of the President of Azerbaijan. During a trip to Shamakhi in November 2009, President Ilham Aliyev visited the Juma Mosque and enacted a decision on the restoration of the monument, which has great historical value and holds a special place in the spiritual world of the Azerbaijani people. According to the orders signed by the President in December 2009 and February 2013, funds were allocated for this purpose. Then the major overhaul and reconstruction commenced at the mosque, which is a fine example of architecture of the capital of the state of Shirvanshahs. The reconstruction of the mosque had started in March 2010. Along with the reconstruction of the mosque proper, the old cells located around the Shamakhi Juma Mosque state historical and architectural monument have been restored and the area has been extensively landscaped. The delegation was also informed about the model of Azerbaijani tolerance. The international experts were also told of the special attention paid to the restoration and reconstruction of archeological monuments reflecting the historical past of the Shamakhi region. During the visit of the experts' group, meetings with representatives of different religions in the regions, visits to monuments reflecting the centuries-old tolerance history in the country are scheduled.